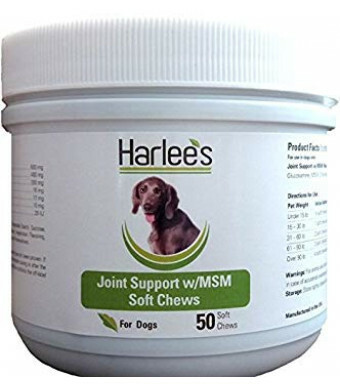 Joint Support w/MSM Max Strength Soft Chews for dogs are formulated with a comprehensive blend of Glucosamine, MSM, Chondroitin and Omega-3 Fatty Acids in a great tasting soft chew dogs love. Ideal for promoting cartilage development, supporting healthy joint functions and flexibility, and managing discomfort due to normal daily activities. Glucosamine HCl A naturally-occurring ingredient found in joint tissue and synovial fluid that helps with the production of glycosaminoglycans (GAGs), essential for joint lubrication and nutrient transport. Helps lubricate the joint and supports healthy joint mobility and flexibility. Plays an important role in healthy cartilage development. Supports a healthy inflammatory process and helps manage discomfort due to normal daily activity. Chondroitin The Building block for joint cartilage and bone. 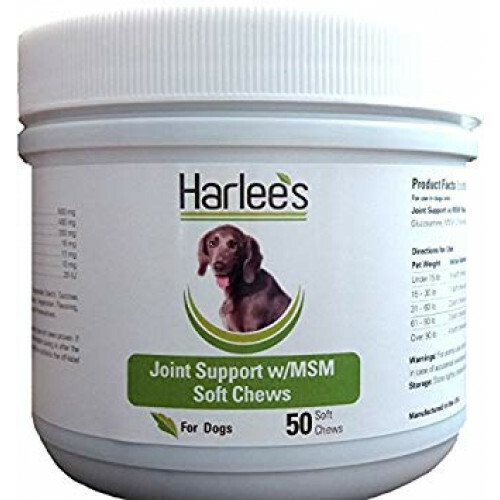 Helps support the normal shock-absorbing properties and elasticity of joint cartilage and connective tissue. MSM (Methylsulfonylmethane) A natural source of biological sulfur that help support healthy cellular function and provides antioxidant benefits. Supports the normal inflammatory process. Active Ingredients: (per 7.5g soft chew): Glucosamine HCl (Shellfish) 500 mg Methylsulfonylmethane (MSM) 400 mg Chondroitin (Porcine) 200 mg Eicosapentaenoic Acid (EPA)18 mg Docosahexaenoic Acid (DHA)12 mg Manganese Sulfate 10 mg dI-Alpha Tocopherol Acetate (Vitamin E) 20 IU Inactive Ingredients: Glycerin, Molasses, Vegetable Oil, Macrogol, Vegetable Starch, Sucrose, Vegetable Fiber, Pork Liver Powder, Fish Oil, Dicalcium Phosphate, Vegetarian Flavoring, Magnesium Stearate, Vegetable Shortening, Manganese Sulfate, Natural Preservatives.